Welcome to YCS Salt Lake City! We have 528 players here today, and our Round 1 Feature Match comes from Table 139. 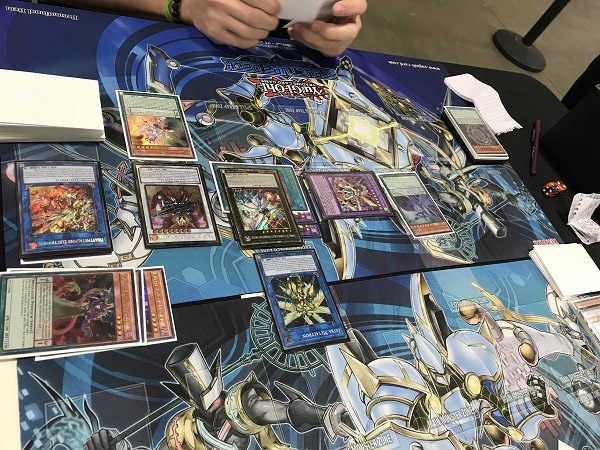 This is 12-year-old Austin Marden’s first YCS event, and he has a solid Blue-Eyes White Dragon Deck taking advantage of the newly-available Dragon Revival Rhapsody from Legendary Collection Kaiba! His opponent is 25-year-old Anthony King from Aurora, Colorado who has Pendulum Magicians with him. It’s an old favorite versus a current favorite in Round 1. It’s time to Duel! King won the roll and elected to go first. He started off with Supreme King Dragon Darkwurm, using its effect to add Supreme King Gate Zero from his Deck to his hand. He then activated Astrograph Sorcerer in the Pendulum Zone, using its effect to have it destroy itself to Special Summon Stargazer Magician from the Deck. He then used both monsters to Link Summon Heavymetalfoes Electrumite. He used the effect when it was Link Summoned to send another Astrograph Sorcerer from his Deck to the Extra Deck. He then placed Supreme King Gate Zero in the Pendulum Zone and then used Heavymetalfoes Electrumite’s effect to destroy Supreme King Gate Zero and add back Astrograph Sorcerer to his hand. 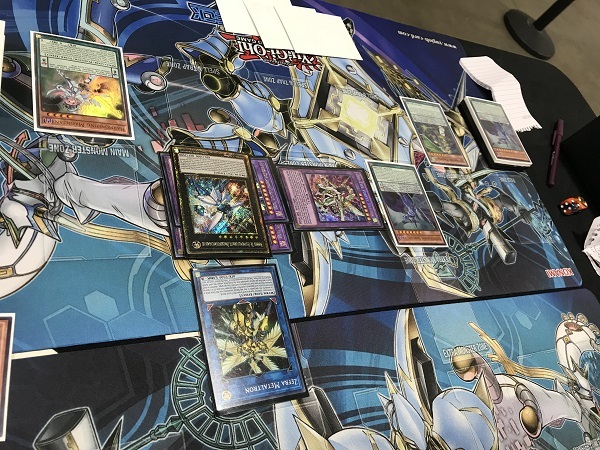 In a new Chain, Astrograph Sorcerer activated to Special Summon itself and add another Supreme King Gate Zero from his Deck to his hand, and then he drew a card with Heavymetalfoes Electrumite’s effect. He then placed Oafdragon Magician and Black Fang Magician in the Pendulum Zones, and then proceeded to Pendulum Summon Harmonizing Magician from his hand, along with Astrograph Sorcerer and Supreme King Gate Zero from the Extra Deck. He used Harmonizing Magician’s effect to Special Summon Purple Poison Magician from the Deck. He used Astrograph Sorcerer and Gate Zero to Xyz Summon Odd-Eyes Absolute Dragon, then used it and Heavymetalfoes Electrumite to Link Summon Zefra Metaltron. Odd-Eyes Absolute Dragon’s effect Special Summoned Odd-Eyes Vortex Dragon from the Extra Deck. He then used Purple Poison Magician and Harmonizing Magician to Special Summon Supreme King Dragon Starving Venom from the Extra Deck. He used the Dragon’s effect to copy Heavymetalfoes Electrumite’s effect, whose effect destroyed Black Fang Magician and added back Harmonizing Magician from the Extra Deck. Black Fang Magician’s effect activated in the Graveyard, he Special Summoned Astrograph Sorcerer from the Graveyard, and then 2 Astrograph Sorcerers were used to Special Summon another Supreme King Dragon Starving Venom from the Extra Deck. He used the second Supreme King Dragon Starving Venom to copy Heavymetalfoes Electrumite again, then activated Harmonizing Magician in the Pendulum Zone. Then he used the copied effect of Heavymetalfoes Electrumite to destroy the Harmonizing Magician and add another Astrograph Sorcerer from the Extra Deck back to his hand. He Special Summoned it and added another Harmonizing Magician from his Deck to his hand. He then used Oafdragon Magician’s effect to add Harmonizing Magician from the Extra Deck back to his hand. He then used both Supreme King Dragon Starving Venoms to Xyz Summon Number 38: Hope Harbinger Dragon Titanic Galaxy! Marden drew Dragon Shrine for turn to add to his hand of 2 copies of Return of the Dragon Lords, Dragon Spirit of White, Pot of Desires, and The White Stone of Ancients. He activated Desires first, baiting out Number 38’s negation effect. He then activated Dragon Shrine to send Dragon Spirit of White and Blue-Eyes White Dragon to the Graveyard. He then activated Return of the Dragon Lords to Special Summon Blue-Eyes White Dragon, but King used Vortex Dragon’s effect to negate Return. Marden then activated the second Return of the Dragon Lords to Special Summon Dragon Spirit of White, whose effect banished King’s Oafdragon Magician. He then Normal Summoned The White Stone of Ancients and used both monsters to Synchro Summon Blue-Eyes Spirit Dragon in Defense Position. He passed there. King activated Supreme King Gate Zero in the vacant Pendulum Zone, then Pendulum Summoned Harmonizing Magician from his hand. He used its effect to Special Summon Purple Poison Magician from the Deck. He used Harmonizing Magician and Purple Poison Magician to Synchro Summon Ignister Prominence, the Blasting Dracoslayer and activated its effect targeting his own Gate Zero. King Chained Blue-Eyes Spirit Dragon’s effect to Special Summon Black Rose Moonlight Dragon. The Chain resolved and Ignister’s effect sent Marden’s Black Rose Moonlight Dragon back to the Extra Deck. (Moonlight Dragon’s effect couldn’t activate in a new Chain.) All of King’s monsters attacked to wipe out all of Marden’s 8000 LP! 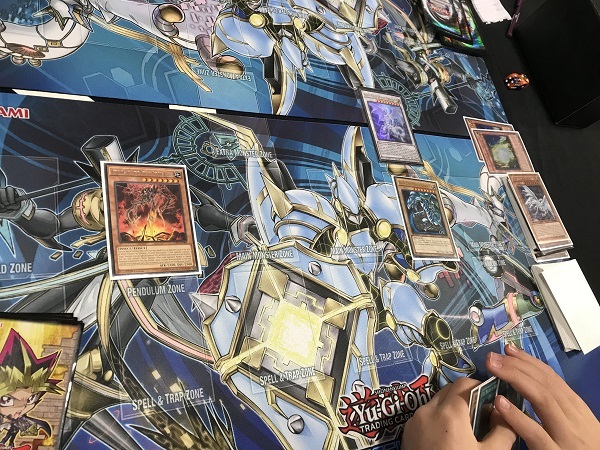 Marden opened with 2 copies of Sage with Eyes of Blue, The Melody of Awakening Dragon, Trade-In, and Dimensional Barrier. He started off by Setting Dimensional Barrier and Normal Summoned Sage with Eyes of Blue whose effect added The White Stone of Ancients from his Deck to his hand. He then used the other Sage effect from his hand, sending it and the one on the field to the Graveyard to Special Summon Blue-Eyes White Dragon from the Deck! He then activated The Melody of Awakening Dragon, discarding The White Stone of Ancients and adding Blue-Eyes White Dragon and Blue-Eyes Alternative White Dragon from his Deck to his hand. He then Special Summoned Alternative, then activated Trade-In, discarding Blue-Eyes White Dragon to draw Effect Veiler and another The White Stone of Ancients. He used both Dragons to Xyz Summon Number 62: Galaxy-Eyes Prime Photon Dragon, then used it to Xyz Summon Number 95: Galaxy-Eyes Dark Matter Dragon! He used its effect to send Dragon Spirit of White, The White Stone of Ancients and another Alternative to the Graveyard to make King banish Supreme King Dragon Darkwurm and 2 copies of Ash Blossom & Joyous Spring from his Deck. “Since you already used a lot of your search cards,” as King remarked, he was able to justify removing his Ash Blossoms from the Duel. Marden then used the Graveyard effect of Ancients to banish it and add back one of the Alternatives. In the End Phase, he used the other copy to Ancients to Special Summon Blue-Eyes White Dragon from the Deck. King drew for turn. He activated Astrograph Sorcerer in the Pendulum Zone, but King Chained Dimensional Barrier declaring Pendulum, preventing King from Special Summoning Pendulum Monsters and negating Pendulum Monster effects for the rest of the turn. King set a monster and passed. Marden drew Soul Charge for turn. He used The White Stone of Ancients’s effect, banishing it from his Graveyard to add Blue-Eyes White Dragon from his Graveyard to his hand. He then Special Summoned Alternative by revealing the Blue-Eyes White Dragon he just added back to his hand. He went into the Battle Phase and used Number 95 to attack into the face-down Timegazer Magician. King used the effect of Chronograph Sorcerer to Special Summon both itself and Supreme King Gate Zero from his hand. (Marden tried to attack twice with Number 95 but he couldn’t since he didn’t activate its effect in his Main Phase.) The other 2 Dragons attacked and destroyed the Spellcasters. In Main Phase 2, Marden Set The White Stone of Ancients and passed. King used Astrograph Sorcerer’s effect to have it destroy itself and Special Summon Stargazer Magician from the Deck. He then activated another Astrograph Sorcerer from his hand, Special Summoning it and adding another Astrograph Sorcerer from his Deck to his hand. He used Astrograph Sorcerer and Stargazer Magician to Link Summon Heavymetalfoes Electrumite; but Marden used Effect Veiler to negate its effect. King then Special Summoned Kumongous, the Sticky String Kaiju to Marden’s field by Tributing Marden’s Number 95: Galaxy-Eyes Dark Matter Dragon! He passed there. Marden drew The Melody of Awakening Dragon for turn. He used Blue-Eyes Alternative White Dragon’s effect to destroy King’s Heavymetalfoes Electrumite, then Flip Summoned The White Stone of Ancients. Marden then used The White Stone of Ancients and Blue-Eyes Alternative White Dragon to Synchro Summon Blue-Eyes Spirit Dragon in Attack Position. Marden attacked with all 3 monsters to bring King down to 100 LP! King drew to 3 cards in hand but didn’t have an answer. We’re going to a third Duel! King elected to go first. He activated Foolish Burial, sending Supreme King Dragon Darkwurm from his Deck to his Graveyard. Its effect let it Special Summon itself and then he added Supreme King Gate Zero from his Deck to hand. He placed Astrograph Sorcerer in the Pendulum Zone and used its effect to have it destroy itself and Special Summon Stargazer Magician from the Deck. The 2 monsters were used to Link Summon Heavymetalfoes Electrumite and its effect put another Astrograph Sorcerer from the Deck to the Extra Deck. He activated Supreme King Gate Zero, then Heavymetalfoes Electrumite’s effect destroyed Gate Zero and added back Astrograph Sorcerer, whose effect let King Special Summon it and add the third Astrograph Sorcerer from his Deck to his hand and draw a card. He then activated Chronograph Sorcerer in the other Pendulum Zone and used the effect to Special Summon Timegazer Magician. King used Astrograph Sorcerer to search for Chronograph Sorcerer. He used Astrograph Sorcerer and Timegazer Magician to Special Summon Supreme King Dragon Starving Venom from the Extra Deck. He then activated Black Fang Magician to the Pendulum Zone then used the Dragon’s effect to copy Heavymetalfoes Electrumite. Then he used the copied effect to destroy Black Fang Magician and add back Astrograph Sorcerer, whose effect activated to have it Special Summon itself and add another Black Fang Magician from his Deck to his hand. The 2 Astrograph Sorcerers were used to Xyz Summon Odd-Eyes Absolute Dragon. 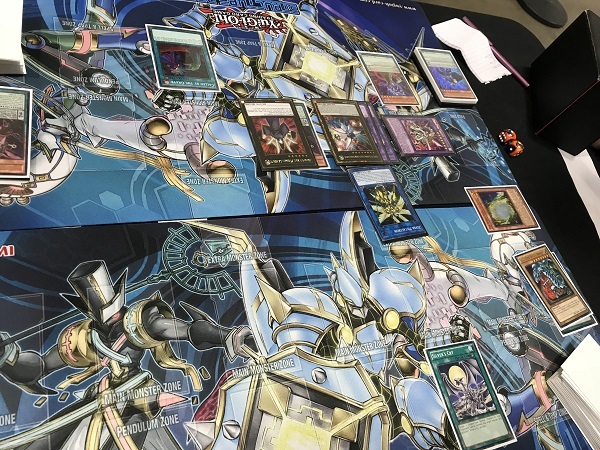 Then, it and Heavymetalfoes Electrumite were used to Link Summon Zefra Metaltron, and Odd-Eyes Vortex Dragon was Special Summoned with Absolute Dragon’s effect. King then activated Black Fang Magician and Purple Poison Magician in the Pendulum Zones. He then Pendulum Summoned Chronograph Sorcerer from hand, then another Chronograph Sorcerer and Astrograph Sorcerer from the Extra Deck. He sent Astrograph Sorcerer and Chronograph Sorcerer back to the Extra Deck to Special Summon Supreme King Dragon Starving Venom, and King used the effect to copy Heavymetalfoes Electrumite. He used the copied effect to destroy Black Fang Magician and add Chronograph Sorcerer back to his hand. He then used Chronograph Sorcerer to have it Special Summon itself from the hand. He then used both Supreme King Dragon Starving Venoms to Xyz Summon Number 38: Hope Harbinger Dragon Titanic Galaxy! Finally, he used both Chronograph Sorcerers to Xyz Summon Norito the Moral Leader! He set one card to the back row and passed. Marden drew Dragon Shrine to add to his hand of two Trade-In, The White Stone of Ancients, Soul Charge and Silver’s Cry. He used Dragon Shrine to send Blue-Eyes White Dragon and The White Stone of Ancients from his Deck to the Graveyard. He then used Ancients’s effect, banishing it to try and add Blue-Eyes White Dragon back to his hand. King Chained Called by the Grave to try to banish Blue-Eyes, Marden Chained Silver’s Cry from his hand to try to Special Summon that same Blue-Eyes, and then King then chained Norito’s effect to negate Silver’s Cry! The Chain resolved and Blue-Eyes ended up banished! He Set Ancients and Trade-In and passed with time in the Round being called here. King switched Odd-Eyes Vortex Dragon to Attack Position. Zefra Metaltron attacked and destroyed Ancients, and the rest of the monsters attacked directly to end the Match! 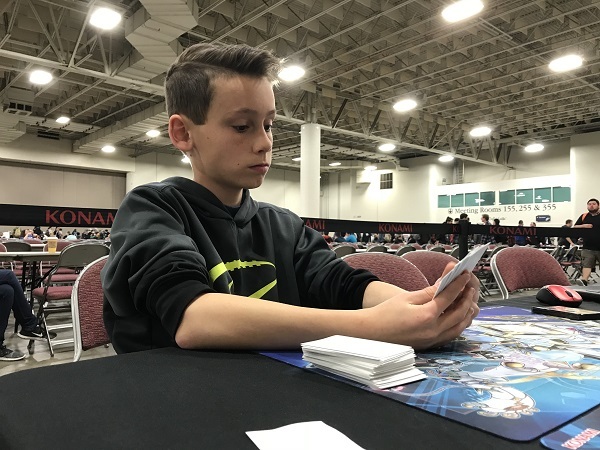 Anthony King starts off YCS Salt Lake City with a victory, but we got to see some impressive Dueling from 12-year-old Blue-Eyes Duelist Austin Marden! 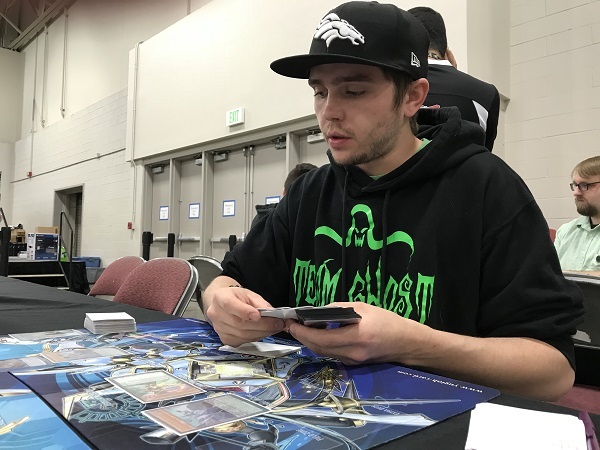 YCS Salt Lake City: Standings After Round 2 YCS Salt Lake City: Round 2 Pairings!